April 4th is National Ramen Day. It’s also National Burrito Day, National Carrot Day and National Cordon Bleu Day. In case you’ve never had a ramen burger, it’s a hamburger where fried ramen, formed into a bun shape, replaces the bread bun. 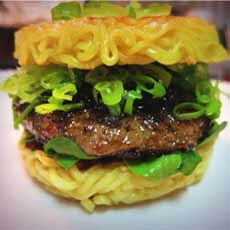 The American version of the ramen burger (photo #1) was created in 2013 by Keizo Shimamoto, a ramen blogger turned ramen chef (his ramen shop closed last week). He had inspiration from ramen burgers he saw while in Japan. Restaurants there used ramen noodles to form a top and bottom, although the top and bottom “buns” were not as solidified as Keizo’s ramen buns. Instead of a beef patty, the Japanese filled the ramen buns with chashu pork. Chashu pork is pork belly braised in soy sauce, sake, and mirin (rice wine*). The inspiration is that bowls of ramen soup are often topped with slices of the braised pork belly. Creating a Japanese-American fusion, Keizo sandwiched a beef burger slathered in a “secret” shoyu sauce (soy sauce seasoned with brown sugar, garlic, ginger and shallot) instead of ketchup. Arugula and a scallion garnish taking over for lettuce and onion. 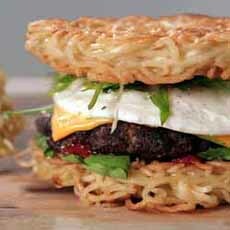 The ramen burger started a craze among food bloggers everywhere, who created their own versions. After checking out different recipes online, we chose this one from Pigamitha Dimar (photo #2). Different bloggers add different touches; for example, cheese and/or a fried egg (photo #2 (bottom burger) and photo #3). Add tomato or pickled vegetables. Japanese pickles are called tsukemono. You can buy them at Asian food stores. American pickles of all kinds work, too. There’s also gari, the pinkish pickled ginger served with sushi. Consider Kewpie brand mayonnaise†, Japan’s favorite mayo. Any burger works: beef, grain, lamb, turkey, veggie, etc.You can even make it a double, as in photo #2. The original ramen burger (photo courtesy Keizo Shimamoto). 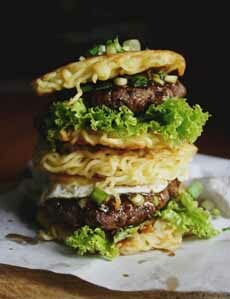 A double ramen burger created by Pigamitha Dimar. Here’s her recipe. This ramen burger adds cheese and a fried egg. Here’s the recipe from Sarah N Spice. Whatever burger you choose, you can add Japanese condiments and spices to the chopped meat for extra flavor. Ready to create your own ramen burger? It’s a fine way to celebrate National Ramen Day. *Mirin and saké are both called “rice wine.” Both are fermented from rice; mirin has a lower alcohol content and higher sugar content (as an analogy, think of sweet and dry vermouths. If you have saké but no mirin, make a substitute by adding a half teaspoon of sugar to the saké, and warm it slowly to dissolve the sugar. 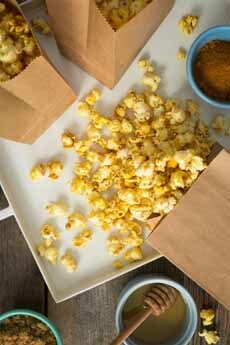 †It is made with more egg yolks, rice vinegar instead of distilled white vinegar, and MSG. Delicious: a baked potato filled with a tomato-basil balsamic relish (photo courtesy Idaho Potato Commission). 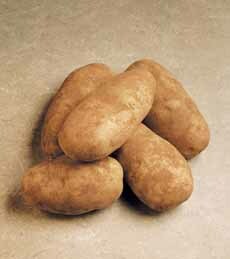 Russet Burbank variety of russet potatoes (photo courtesy Idaho Potato Commission). An artichoke-stuffed baked potato. 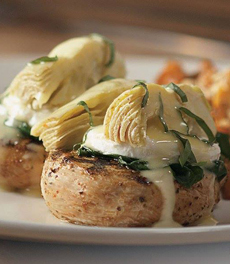 Here’s the recipe from Bonefish Grill. But given that the ingredients are available year-round, consider it a baked potato that puts bright colors on your plate any time of year. 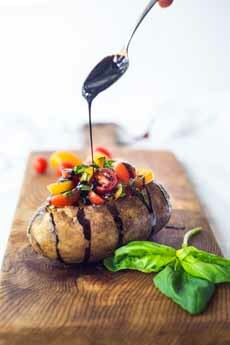 Cherry tomatoes and basil ribbons (chiffonade) are tossed in a simple-but-flavorful balsamic dressing, then spooned over the hot baked Idaho russet potatoes and drizzled with a balsamic glaze. Bake the potatoes while you make the relish. 1. PLACE the sliced tomatoes, garlic, basil ribbons, olive oil, balsamic vinegar, salt and pepper into a medium bowl and mix to combine. 2. CUT a slit into the warm baked potatoes and fluff up the flesh with a fork. 3. DIVIDE the tomato relish between the two potatoes. Garnish with a drizzle of balsamic glaze. Serve immediately. Here’s a recipe to make baked potatoes in an Instant Pot in one-third the time. We prefer Russet Burbank potatoes, oven-roasted at a slightly higher temperature to make the skin crispy. In agriculture, there are numerous varieties or breeds of everything, from avocados to zucchini (and cattle, goats, etc.). Each variety contributes slightly different features (e.g., grows better in a certain soil). Many stores stock the Russet Norkotah potato variety, which is slightly moister than other varieties. But the moist flesh is a trade off: the skin doesn’t get crispy when baked. Instead, you need the Russet Burbank. It’s a tiny bit drier, but if you add butter, sour cream or other moist topping (like the balsamic tomatoes in the recipe above), you won’t notice the difference. How do you know if your spud is a Russet Burbank? If you buy potatoes by the bag, then by law, Idaho potatoes have to have the variety noted on the package. Somewhere non the closure, tag or label the variety will be indicated. If you’re just a twosome for Easter dinner, you may not want to take on a half ham or a leg of lamb. Lamb chops are appropriate, of course; but how about a loin of rabbit—or a mixed grill of both. 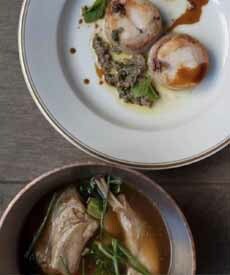 Rabbit can be served to any number of people, but we especially like it for a small group or as one small course in a multi-course (five or more) dinner. If you’re a carnivore but the idea of rabbit seems alien to you, just try it. Rabbit is a common dish throughout Europe, and it’s surprising that it’s not found more often in the U.S.—especially since it’s the most nutritious meat (see below). Moist and tender, this ultra-lean, delicate meat with a slightly sweet* flavor is, like chicken, versatile and easy to prepare. The texture is similar to chicken, but we find rabbit more flavorful. It adapts well to any sauce or seasoning. It can be braised, fried, grilled, oven- or pan-roasted, sautéed or stewed—just like chicken. Even prepared simply, it is delectable. We prefer the sautéed or pan-roasted loin to the legs, which are less tender and need to be braised. Add some herbs white wine for the recipe. 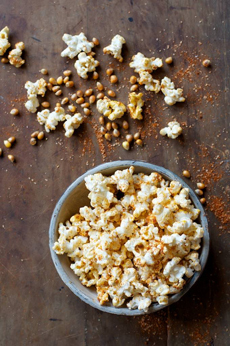 Pile on your favorite flavors: Dijon mustard, garlic, onions. For a richer dish, add crème fraîche near the end of cooking to make a creamy sauce. Or, wrap it in bacon, with an optional layer of seasoned spinach between the loin and the wrap. It doesn’t have to be an elegant dish. Consider this southern dish: Crispy Buttermilk Fried Rabbit Legs, served with coleslaw and cornbread. According to D’Artagnan, purveyor of quality farm-raised rabbit, the USDA states that rabbit is the most nutritious meat. Nutritionally, rabbit is lower in calories and cholesterol, but higher in protein than beef, chicken, lamb, pork, turkey and veal. If you can’t find rabbit loin locally, you can order it online from D’Artagnan. Their rabbits are humanely raised by small-scale farms, with no antibiotics or hormones. Preparations of rabbit loin (top) and leg at one of New York City’s finest restaurants, Le Coucou. Rabbit loins are boneless. These are from D’Artagnan. Cooking can be as simple as a pan-roast or a braise (photo courtesy D’Artagnan). *Farm-raised rabbit is tender and sweet. Wild rabbit can be gamy and tougher. Wild rabbit may also carry tularemia bacteria; meaning it must be cooked to well done. 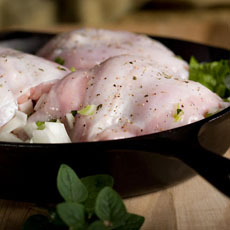 For rare or medium cooked rabbit dishes, farm-raised rabbit from a reliable breeder must be used. Like egg rolls but feel guilty about eating the fried wrapper? Here’s a healthy improvement from Pampered Chef: the insides of an eggroll, cooked in a skillet. You can serve it atop rice as a main course, or without rice as a side. 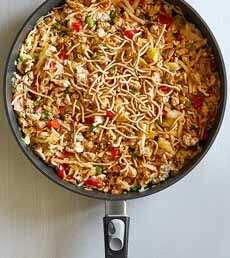 If you need some crunch, add a few chow mein noodles or sesame sticks as garnish. The filling of an egg roll is largely shredded cabbage. That’s why a coleslaw mix is such a time saver. But if you want to go old school, use 1 small head of cabbage and 2 medium grated carrots. In step 3, cook for an additional 3–5 minutes. The filling of an egg roll without the fried wrapper (photo courtesy Pampered Chef). 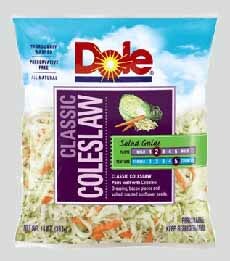 Packaged coleslaw is a time saver in this recipe (photo courtesy Dole). 1. HEAT the oil in a 12″ nonstick skillet over medium heat for 3–5 minutes. Cut the onion into chunks and chop. 2. ADD the onion and sausage to the skillet. Cook for 5–7 minutes, breaking the sausage into small pieces that will mix in evenly. 4. MAKE the sauce. Finely chop the scallion and the soy sauce, honey, and sriracha. Whisk well (or blend in a food processor) until combined. 5. POUR the sauce into the skillet. 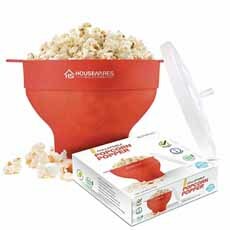 Cook, uncovered, for 1–2 minutes, or until evenly combined and heated through. 6. PLACE rice into bowls and top with the mixture. Garnish with chow mein noodles or sesame sticks, if desired.